Researchers at the Georgia Institute of Technology have developed a material from two naturally-occurring polymers that could offer an environmentally-friendly alternative to traditional plastic packaging for food and consumer goods. The material is made by layering cellulose — the most abundant biopolymer on Earth — with chitin, which is widely found in shellfish, insects and fungi. Cellulose is a linear homopolymer of glucose, while chitin is a linear homopolymer of N-acetyl glucosamine. Both biopolymers are found in the hierarchical structures of plant cells and crustacean exoskeletons, respectively, from which nanocrystals and nanofibres can be extracted. Cellulose nanocrystals and nanofibres, and chitin nanowhiskers and nanofibres, have a high Young’s modulus and tensile strength as well as being good barriers to many gases, including oxygen. The research team, led by Carson Meredith, created films from the two biopolymers by suspending cellulose nanocrystals (CNCs) and chitin nanofibres (ChNFs) — which are negatively and positively charged, respectively — in water, and then spraying them onto a compostable substrate in alternating layers. The processing technique is compatible with roll-to-roll coating. 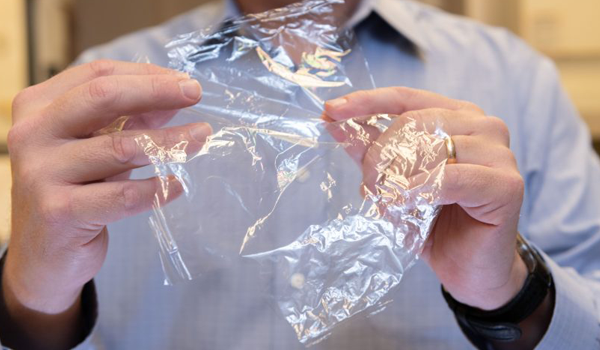 Meredith and colleagues found that the material shows up to a 67% reduction in oxygen permeability compared to some forms of polyethylene (PET), which is one of the most common plastics employed in transparent food packaging today. This improvement comes from the crystalline structure of the nanofibres and means that it could, in theory, keep foods fresher for longer, say the researchers. The most impermeable composites were the ones that were made of three alternating layers of ChNF-CNC-ChNF). It is not all plain sailing though, and the researchers say that they now need to develop a scaled-up manufacturing process so that their film is cost competitive with traditional packaging materials. “What is more, while industrial processes to mass produce cellulose are mature, methods to produce chitin are still in their infancy,” explains Meredith. “And, more research is also needed to improve the material’s ability to block water vapour.